My husband Mike – who is into all things vintage – spotted recently that the British Library had uploaded a million images to Flikr for public use. These are illustrations covering the 1600s, 1700s and 1800s. There is quite a variety, from maps to satirical cartoons. 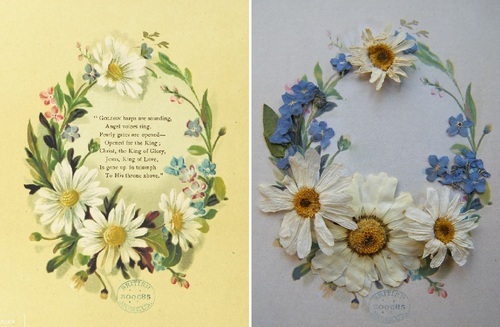 He found me this lovely illustration of daisies and forget-me-nots with a religious text (left below), which I adorned in my usual way with pressed flowers from my garden, after removing the writing. So, inspired, I had a look on Flikr myself and found a couple more suitable images. I printed out a copy of the image and adorned it using dried roses and jasmine I had picked from my garden last summer. 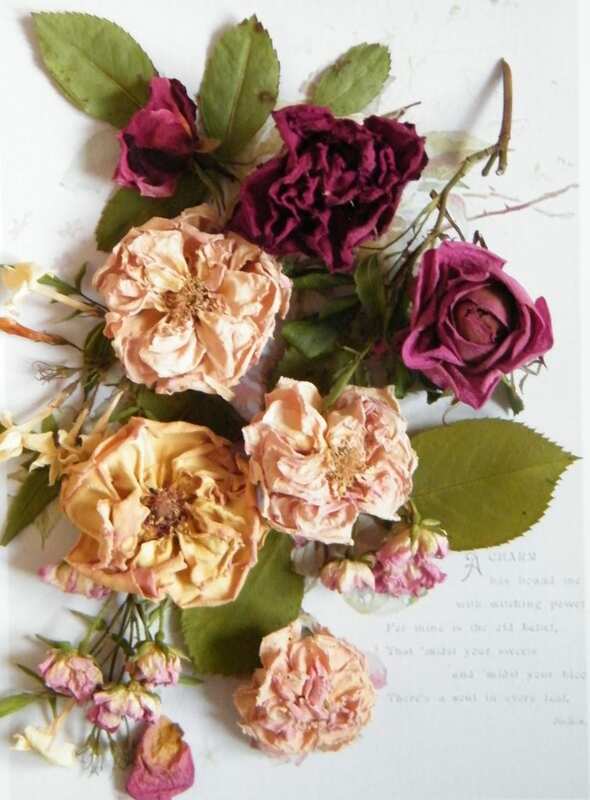 The roses were dried by cutting off the head and laying it flat, face up on a shelf to allow the centres to show. I was quite surprised how fresh the jasmine looked once dry, but it was rather brittle. Find out more about drying flowers at home. The next image is my favourite. 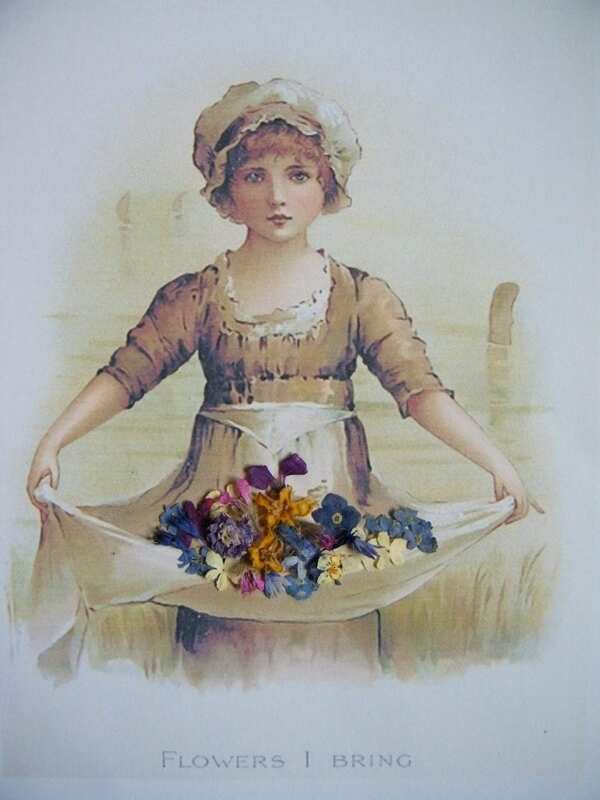 A girl with an apron full of flowers, taken from another book of poems. I had lots of fun with this, and I think my flowers brighten up the whole image. Again I used flowers and florets dried from my own garden, this time including forget-me-nots, cornflower petals, verbascum florets, viburnum florets, geranium and pelargonium flowers, erysimum, viola and anchusa. 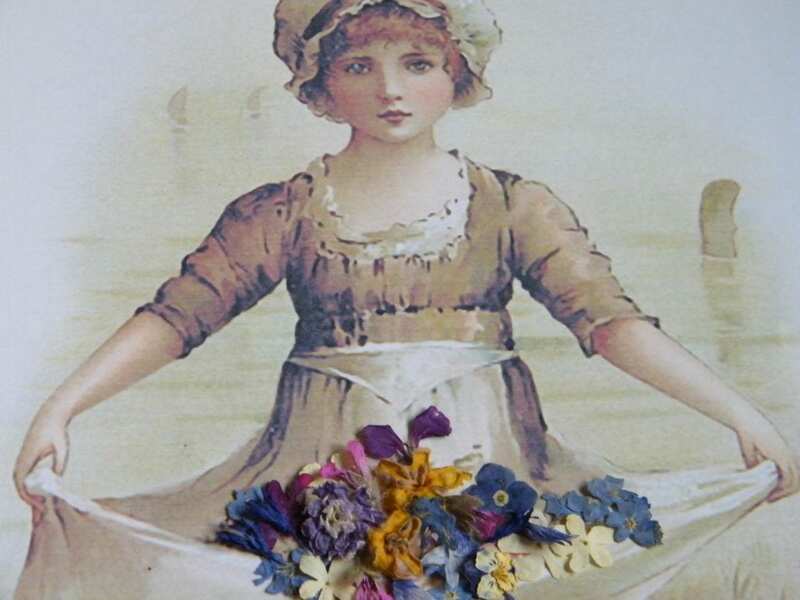 I used a mixture of pressed flowers and dried flowers, and had to resort to using a pair of tweasers as it was rather fiddly. Goodness knows what experts in the Victorian language of flowers would make of that little lot! I couldn’t help thinking this idea would be great for making a special card for someone. It would certainly be unique! 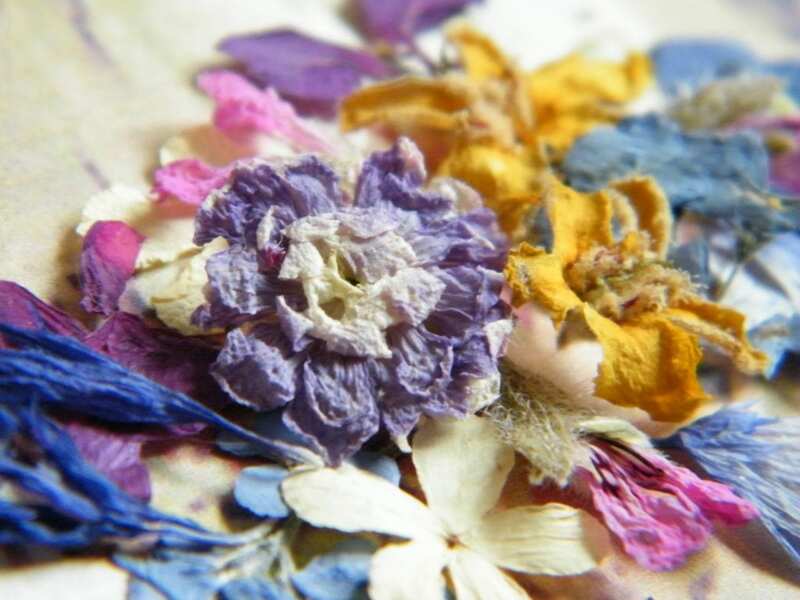 Shopping – buy ready-made pressed flowers.